With my first wish, I’d ask the genie for enough money that my family is set for life and we can do what we want. My second wish would be something political and I probably shouldn’t get into specifics here. My third wish, though? Let’s talk about health for all the fantasy football players. I’d love to see what a 16-games-every-season Rob Gronkowski would do. 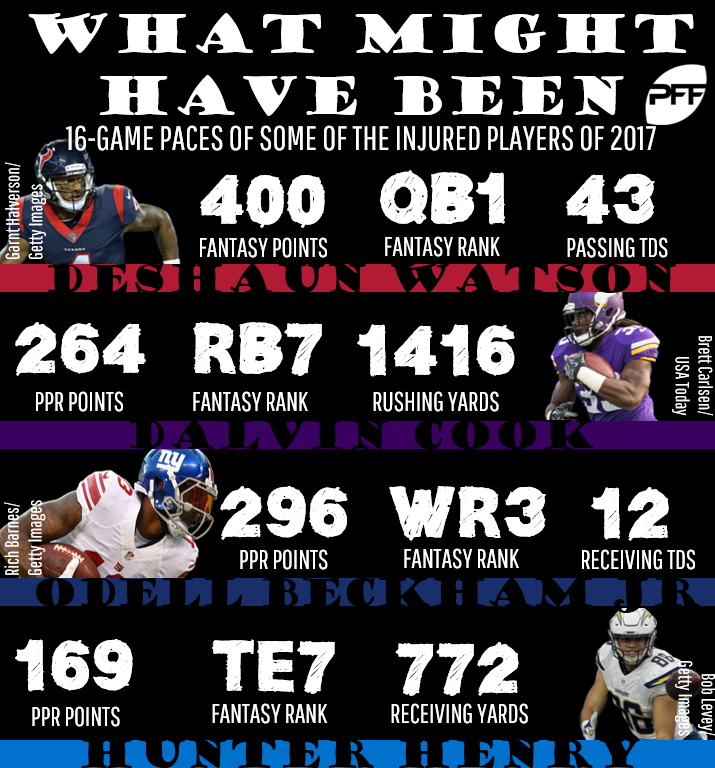 I want to see how Deshaun Watson’s electric rookie season would have finished. Odell Beckham Jr. plays the whole season, Dalvin Cook gets an actual debut year, and for good measure, we get to see J.J. Watt wreak havoc all the time. The closest analogue we have to that is extrapolation. Watson played seven games last year and averaged 25 fantasy points per game. Over 16 games, that would have been an easy league-leading 400 fantasy points, the fifth-best quarterback season of the last decade (more if you give him credit for only playing part of Week 1, but we aren’t looking for hard and fast science here). We’ve talked about Watson’s season at length. It was incredible. Putting it into 2017 context doesn’t feel helpful, especially when we step back and realize that it’s hard to imagine regression not working its way in. Instead, lets marvel at the seasons in the last 10 years that were better than a 16-game Watson season. Peyton Manning in 2013 put up 432 fantasy points, 27 fantasy points a game. That he was essentially washed up a year-ish later makes it all the more incredible. Cam Newton in 2015 put up 407 as the Panthers flirted with a perfect season. His 636 rushing yards and 10 rushing scores were the real catalyst here. Drew Brees and Aaron Rodgers tied as the No. 1 quarterback in 2011 with 403 points apiece. Brees bested Rodgers by more than 800 passing yards, but also had 8 more interceptions, while Rodgers had 170 more rushing yards and 3 rushing scores compared to Brees’ 1. (Full admission: There aren’t a lot of surprises at quarterback. They come later.) At the pace he played in 2017, including the game in which he was injured in the first quarter, Rodgers would have been the No. 5 fantasy quarterback of 2017 (and that’s if you include Watson’s pro-rated total as well), just between Alex Smith and Newton. And you’d have to think Rodgers would have scored a rushing touchdown or two the rest of the way — he had 0 in 2017, but has averaged 3.1 rushing scores a season when he’s played 10-plus games. Elliott’s six-game suspension came right in the middle of a productive season where he averaged 20.2 fantasy points a game. As a rookie, Elliott averaged 21.5, and has exactly one game played in his career with single-digit fantasy points. Even with his lack of receiving prowess, Elliott is one of the safest options at the position as long as he keeps himself out of trouble. It’s easy to forget how strong Cook looked early in the year, since it’s been so long since we saw him and the Vikings did just fine with Jerick McKinnon and Latavius Murray shouldering the load. But Cook’s rookie year started like gangbusters, with 444 yards from scrimmage and 2 touchdowns through four games (and he missed close to half of the fourth game with his injury). Over a full 16 games, that would’ve been 1,516 rushing yards, 360 receiving yards, 8 touchdowns, and a ninth-place PPR finish (with Elliott ahead of him in this exercise). With Cook healthy and McKinnon out of town, the second-year back has extreme upside in 2018. Peterson was a shadow of himself in 2017, particularly during his stint in New Orleans. Once he got to Arizona, he wasn’t good, but he was better. In six games with the Cardinals, Peterson had 514 yards from scrimmage and 2 touchdowns. Over a full season, that would have been almost 1,200 rushing yards, almost 200 receiving, and more than 5 touchdowns, good for a 24th-place fantasy finish. That was largely workload-based, but Peterson’s always been a workload guy. His career sounds like it’s over, but his last stretch was better for fantasy than we’ll probably remember it being. Between the early injury, the complaints about off-field stuff, and general Giants malaise, personally I don’t really remember Beckham’s 2017 season being off to that great a start. But his four-game stretch of 2017 would have left him as the No. 3 receiver across the full season. His numbers would have translated to 1,240 yards and 12 touchdowns with 100 total catches. With a healthy Beckham in 2018 and plenty of offensive weapons around him, there’s no reason not to keep him up near the top of the rankings. Woods had a breakout in 2017, but not by as much as you might have thought. He set a career high in yardage at 781 but had at least 500 yards in each of his other four seasons. He tied a career high with 5 touchdowns and had only the second-most receptions at 56. He had 164 fantasy points last year but 163 in 2014. That 164 total was good for 33rd last year, while 163 was only 45th in 2014, helping make Woods’ total look better. The other difference is that Woods played 16 games in 2014 and only 12 last year; over 16 games he would have topped 1,000 yards and been the No. 19 WR. Gronkowski was the No. 1 tight end last year in standard, but Travis Kelce bested him in PPR by playing two more games. Tight end is down overall, but Gronkowski’s 16-game pace would have been 276 fantasy, the third-best total for the No. 1 tight end in the last decade. Come on, you knew he’d be in here. Reed had 211 yards and 2 touchdowns in 6 games. Across a full season, that would have been about 560 yards and 5 touchdowns (No. 10 tight end), which honestly feels like Reed’s 16-game floor. We know how talented he can be with a full workload, and it’s why he remains an intriguing fantasy option despite missing 28 games across his five seasons in the league.